Shingles, or herpes zoster, is an infection that is caused by the same virus as chicken pox. The typically painful rash is more common as a person becomes older, and it is believed this may be due to a natural decline with age of immune function. However, there is another setting in which shingles is known to emerge in people of all ages – that of a weakened immune system. And therefore having leukemia or lymphoma, and/or being treated for it, puts you at a much greater risk of developing this infection. If you have had chicken pox in the past, or if you were vaccinated for it, the virus never completely leaves your system. Chicken pox vaccines do contain a weakened version of the live virus, which have the potential to cause shingles later in life. Even long after the itchy rash of chickenpox is gone, the virus lays in a dormant or resting state in the spinal nerve cells of our bodies. The symptoms of the virus disappear, and the virus is kept in check by a healthy immune system. In some cases, the virus can be reactivated as shingles. If you have never had chickenpox or been vaccinated for it, you may be off the hook, but it can be difficult to determine for sure that an individual has never been infected with the virus based on history, alone. The risk of developing shingles is much higher in older people. In fact, the chances of the virus becoming reactivated doubles every 10 years over the age of 50. People with a weakened immune system are also at high risk for developing shingles. When your immune system lets down its guard, the virus takes the opportunity to become active again. The major risk factor for the occurrence of viral complications like shingles is the extent of what is known as cellular immunosuppression. The risk increases with the suppression of T-cells, your body’s immune warrior-soldier cells, as seen in the rate of viral complications during treatment with the T-cell antibody alemtuzumab. Neutropenia – or low levels of neutrophil white blood cells – can increase the risk of other infections, but neutropenia, alone, appears to be less important in the case of shingles. Depending on the cancer medication given, the effect on the risk of shingles can vary. For example, The APEX study showed an increased shingles rate in patients receiving bortezomib, so recommendations for preventive use of low-dose acyclovir or valacyclovir can be made. 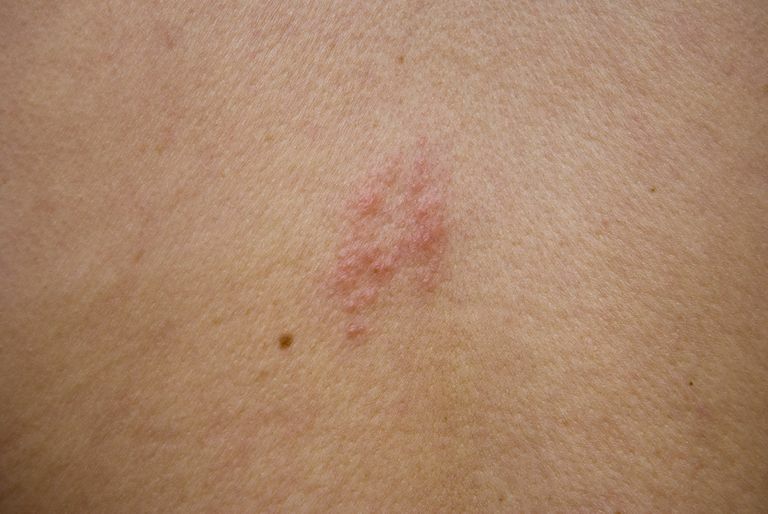 The active shingles virus follows along the nerve where it was dormant. Most often, it presents itself in a band on one side of the body. Shingles is commonly on the torso but can occur anywhere, including your face and extremities. The first symptom that you may experience is pain, itching, burning or tingling along the nerve and the skin surrounding it. In some cases, this may be the only symptom you have. Most people will go on to develop a rash within the next 1-5 days. The skin over the affected nerve will look red and inflamed, and there will be a blistery, painful rash – like chicken pox. Each blister will stay for about a week to 10 days before drying up and turning a crusty yellow. You may also experience flu-like symptoms (fever, fatigue, headaches) while you have the rash. Until the shingles lesions are dried up, it is possible for you to transmit chickenpox to someone who has never had it before or someone who has not been vaccinated. Healthy people who have already had chicken pox are not at significant risk of a repeat infection. But, you should certainly avoid being in contact with others who have a weakened immunity, the very old and the very young, those who have never had chicken pox, and pregnant women. Most doctors can identify shingles just by looking at the rash and hearing your history. In some cases, people with weakened immunity can have unusual distribution patterns to their rash, and your doctor may choose to send a swab for testing to be sure. The goal of shingles treatment is to speed healing and keep the patient comfortable. The use of antiviral medications — such as acyclovir, famciclovir, and valacyclovir — will not kill the virus but will help shorten the length of time until the rash heals and decrease pain symptoms. Antivirals are usually given orally, but intravenous medications may be necessary in very serious cases or in special circumstances. In order to be the most effective, antiviral therapies should be started within the first 72 hours that symptoms are present. Pain control is also important in the treatment of shingles. Over-the-counter medications, such as acetaminophen and ibuprofen, are usually sufficient to treat shingles pain, but in some severe situations, steroids, antidepressants, and anticonvulsant medications may be used to enhance pain management. Because you have a weakened immune system, you are also at risk of developing an infection from the open sores on your skin. This can be made even worse if you indulge in scratching. It is important for you to keep the area clean. Cool, wet compresses may help, and can be applied frequently throughout the day for 20 minutes at a time. If you think you might have shingles, contact your healthcare provider as soon as possible. Getting started on appropriate therapy in a timely manner greatly reduces your risk of long-term complications from shingles. Blood and marrow cancers like leukemia or lymphoma, as well as their treatment, can commonly cause a weakened immune system, some aspects of which are linked to an increased risk for developing shingles. It is possible for shingles to cause long-lasting complications. The likelihood of these complications is decreased when therapy is initiated within the first 72 hours of the appearance of symptoms. Being aware of the warning signs of shingles and contacting your healthcare team right away can help make the course of your infection easier. Kelvin, J., Tyson, L. (2005). Questions and Answers About Cancer Symptoms and Cancer Treatment Side Effects. Jones and Bartlett: Sudbury, MA. Marrs, J. Rash: Is it Shingles? Clinical Journal of Oncology Nursing August, 2006. 10: 463-464. Sandy, M. Herpes Zoster: Medical and Nursing Management. Clinical Journal of Oncology Nursing August 2005. 9: 443- 445. Sandherr M, Hentrich M, von Lilienfeld-Toal M, et al. Antiviral Prophylaxis in Patients with Solid Tumours and Haematological Malignancies – Update of the Guidelines of the Infectious Diseases Working Party (AGIHO) of the German Society for Hematology and Medical Oncology (DGHO). Ann Hematol. 2015;94(9):1441-50. Chanan-Khan A, Sonneveld P, Schuster MW, et al. Analysis of Herpes Zoster Events Among Bortezomib-Treated Patients in the Phase III APEX study. J Clin Oncol. 2008;26:4784–4790. Cornely OA, Ullmann AJ, Karthaus M. Opportunistic Infections After Treatment with Monoclonal Antibodies. Wien Med Wochenschr. 2004;154:209–217.